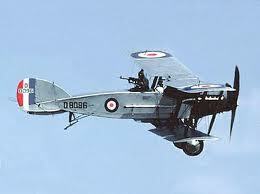 Three outstanding aeroplanes served the British forces in World War One: the RAF SE5a; the Sopwith Camel and Frank Barnwell’s classic two-seater, the Bristol Fighter. Known as the ‘Biff’ to wartime crews, the ‘Brisfit’ in the post-war RAF, this classic design, despite an inauspicious debut in April 1917, went on to become the finest all-round two-seater of the war. With the reliable, powerful Rolls Royce Falcon engine, the Bristol could be flown offensively like a single-seater, with the rear gunner providing a ‘sting in the tail’ to deadly effect. Bristols were also used for light bombing and various types of engines were fitted to improve performance. The aircraft also served in the Middle East and was an effective night-fighter against the Gothas raiding the UK.